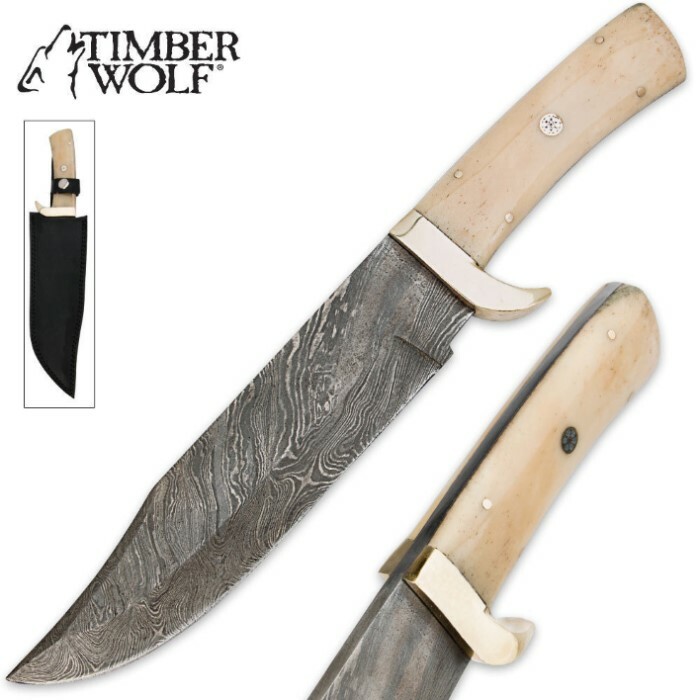 Timber Wolf Damascus & Camel Bone Fixed Blade Clip Point Bowie Knife | BUDK.com - Knives & Swords At The Lowest Prices! Timber Wolf continues to bring you top-quality knives with a custom look and feel at unheard-of prices, and this new fixed-blade bowie knife is no exception. This 8-1/2" Damascus steel blade has a sharp edge with a pronounced clip point in a traditional Bowie knife design. The smooth handle is carved of genuine camel bone with an elegant brass bolster. The superb attention to detail and top-quality materials give this bowie knife the look and feel of a one-of-a-kind, custom-commissioned piece. A leather belt sheath is included. Mine has a few blemishes on the metal. The Damascus pattern on mine is a little too simple and too thin: mostly just vertical lines that get really thin to the point you can hardly distinguish them. I'm assuming it's genuine Damascus, even though I can't make out any glimmer of pattern on the cutting edge or part of the spine that's been polished. If you look closely, you can clearly see that the damascus steel is welded to a different steel just below the brass guard. I didn't take off the scales to see exactly how much real tang there is or how good the weld is. Regardless I'm disappointed about that, no full tang strength and no pretty damascus in between the camel bone scales. I had to cut away some sheath material to get the knife to fit. All in all, it's good-not-great-looking, well-balanced, comfortable knife, only worth it if you get it on sale.